Every year I take out a few first time handliners to show them how it’s down. A lot of times these guys will promise to take me fishing or hunting here, there and everywhere in return. In most instances it never happens but every once and awhile one of them holds true to his promise. This time it was a person who already knew how to handline, he just wanted a little insight on the Trenton Channel. Dan had spent most of his time fishing with his father up on the St. Clair or upper Detroit River. He recently moved down to Melvindale so he wanted to learn how to fish my end of the river. During several of our trips he would talk about his other passion which was deer hunting. He had permission to hunt some property north of Imlay City and he told me I could come along on a few hunts during rifle/muzzle loader season. At the time I didn’t think much of it but he was persistent. He was going to be hunting there the week before Thanksgiving so I took a vacation day and we made it happen. 3:30 am comes way too early. There I was driving down Allen road with no one else on the road. I know, big surprise. A few minutes later I was at Dan’s and unpacking my stuff. He told me to pack light which I did, one shotgun, a box of shells and a Pepsi. I was all set. I was introduced to John and Cisco who would be joining us today as well. A few minutes later we were on the road and headed north. 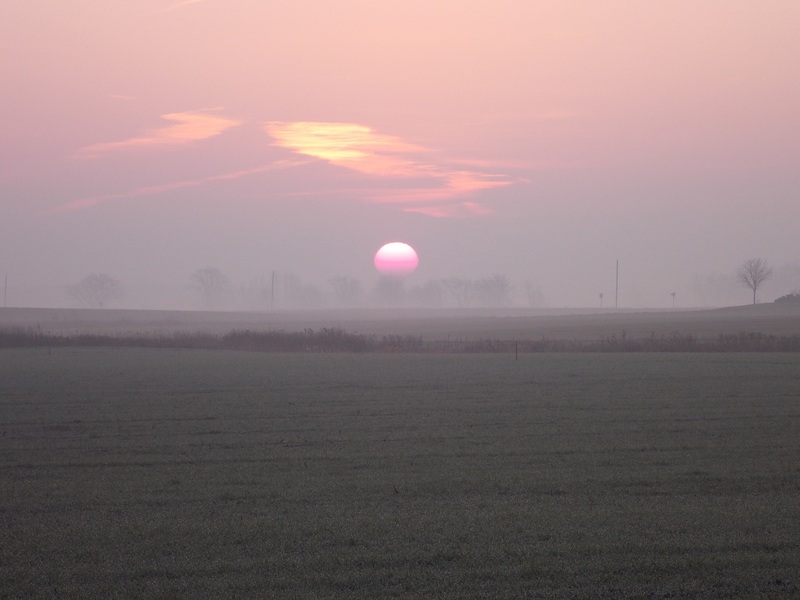 A few hours after that I was seated in a heated blind overlooking a winter wheat field. This was a new experience to me. My deer hunting consisted of small wood lots and swamps. I would find myself a big tree to lean up against and then sit quietly and wait. This modern hunting was very foreign to me. As we sat waiting for the sun to come up Dan explained the situation to me. The landowner was suffering a lot of crop damage from the local deer herd and she wanted them gone. There would be no trophy hunting or any Antler Point Restrictions this day. We had buck tags and antler less permits and our goal was to fill them. We were facing a woodlot and fence line just over 200 yards to our west. This would be where most of the deer would come from. Once a deer crossed the fence and entered the field he/she was fair game. This was the reason why Dan’s CVA inline muzzle loader was zeroed in for 200 yards. As I said before my deer hunting was small areas where my shots are up close and personal. Before today I had never taken a shot at a deer over 100 yards away. This was a little out of my comfort zone. 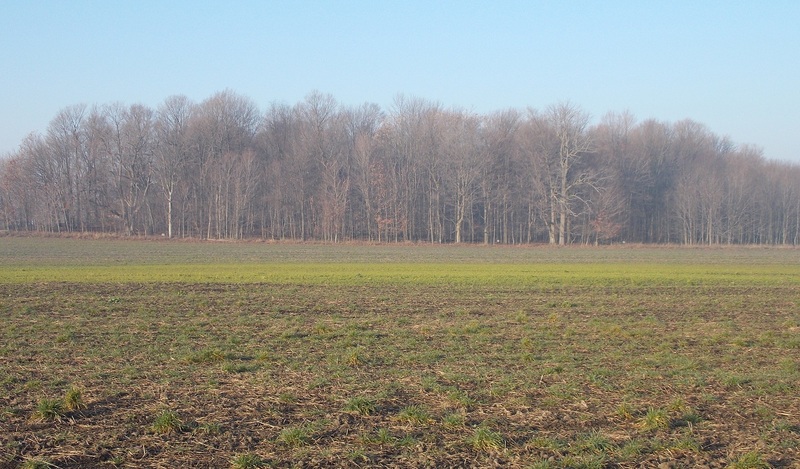 Around 8:00 am we saw our fist deer in the field. It was a mature doe and she slowly worked her way further out into the wheat. Dan marked her with his range finder at 204 yards and he handed me his rifle. There was no way I could make this shot with my old Model 97 Winchester with iron sights so he was nice enough to let me use his muzzle loader. I waited for her to turn broadside so I could get the 200 yard dot high on her shoulder. While I waited a small group of deer came out of the woods farther down the fence line and north of our position. Dan kept on eye on them while I waited for my opportunity. Minutes seemed like hours but she finally gave me a good angle for a shot. Unfortunately I missed. Not a big surprise to me since this was the first time I ever shot an in-line muzzle loader and at a distance like this. Amazingly she never ran off, she just stood there and went back to feeding. Dan quickly re-loaded and I told him to take the shot. By then though she had walked off in the woods but the other deer never left. Dan lined up his shot at the biggest doe at about 260 yards away. He fired and he faired about as well as I did. This time the deer left the field and we were left with our thoughts and theories on why we both missed. We hunted for a few more hours and then headed in for breakfast around 10. We picked up John and Cisco and they hadn’t seen anything. After breakfast we bummed around town for a bit just killing time until we were ready to head our for the evening hunt. At 2:00 pm we were back in the blind and by 2:05 Dan was fast asleep. I figured I wouldn’t bother him, better he sleep now instead of when he was driving me home. Besides he really wasn’t missing anything. He woke up around 3 but we didn’t see any deer until just before shooting hours ended. Only problem was that they were in the next field over and headed north away from us. Oh well, there was always tomorrow. Once again it was 3:30 am and I was heading to Dan’s. When I got to his house he was a little disgusted and the first words out of his mouth were “it’s just you and me today”. Two other people were supposed to join us but both of them were suffering from Brown Bottle Flu which they got Wednesday night, the busiest bar night of the year. Word to the wise. If you are invited to go hunting or fishing don’t go out drinking the night before. If you cancel at the last minute and don’t show up you will get moved down to the bottom of the call list. Ask any of the people I know that weren’t at the dock when it was time to go fishing. We went anyways and just changed our plan of attack. Originally Dan was going to place 1 person on different parts of the property in hopes of getting the deer moving. Since it was just me we decided to just sit in the blind again. Again the deer were there but this morning they all decided to stay on the other side of the fence. We had seen probably close to 20 deer (and 3 dozen turkeys) but they were all too far away. While I was watching a pair of does in the woods Dan spotted two deer running across a field to our north. I got the binoculars on them and it was a buck and what appeared to be a doe. We watched them for the next 20 minutes as the buck repeatedly tried to run off the doe. The buck wanted to head east and every time the doe would follow he would turn and try to run her off. Usually it was the other way around but this situation wasn’t making any sense. Not that it really mattered since they were heading farther and farther east. Right too a blind that Dan later told me he was going to sit me at if everyone had showed. In fact, the two deer finally disappeared into a stand of pines not more than 20 yards from the blind. Deer hunting is just like real estate, location, location, location. Not much happened after that and by 9:30 am we were closing up the blind. We both had family obligations for the afternoon so we packed up and headed home. On the way home we talked about the pair of deer we saw running around the field. The more we talked about the more we thought that the “doe” may have been a small spike and we just couldn’t see the antlers. That would make sense because the other deer was definitely in dominant buck mode. So no deer for the freezer but there is still plenty of time left. Dan told me I was more than welcome to go again, all I would need to do is take another vacation day. Good thing I have about 10 days left to take. It’s also a good thing that I don’t drink and my alarm is good and loud. View of the Sanctuary from the blind. Trust me, they’re in there. 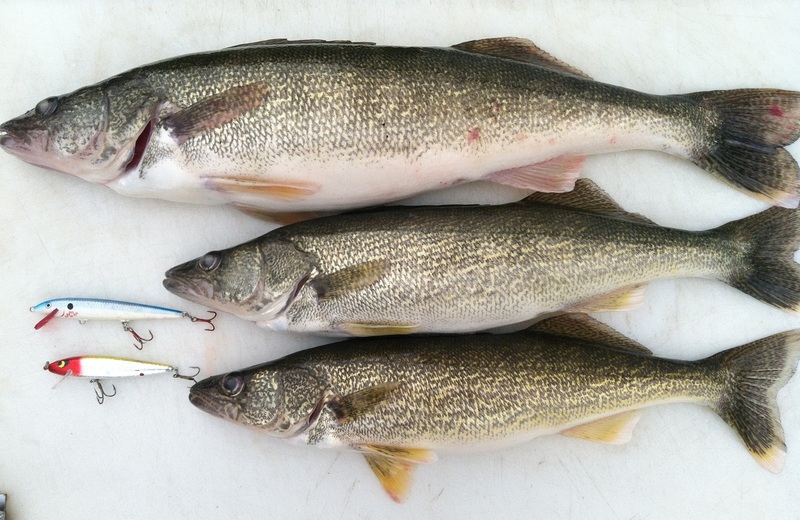 Post Sandy, Early November, Edmund Fitzgerald Anniversary, Pre Veterans Day Walleye. Well after almost 2 weeks of no fishing because of what “Sandy” did to Lake Huron all the way down to Erie I finally got out. Morning fishing had been kind of rough but with the water being dirty I was optimistic. Besides, I had things to do in the evening so I didn’t have much choice. I started fishing around 7:45 am by the Catamaran. The water was dirty but I could see my prop which for me isn’t too bad. From what I had been hearing I expected it to be a lot worse. Surface temps were also 43 degrees which was a big drop from the last time out. 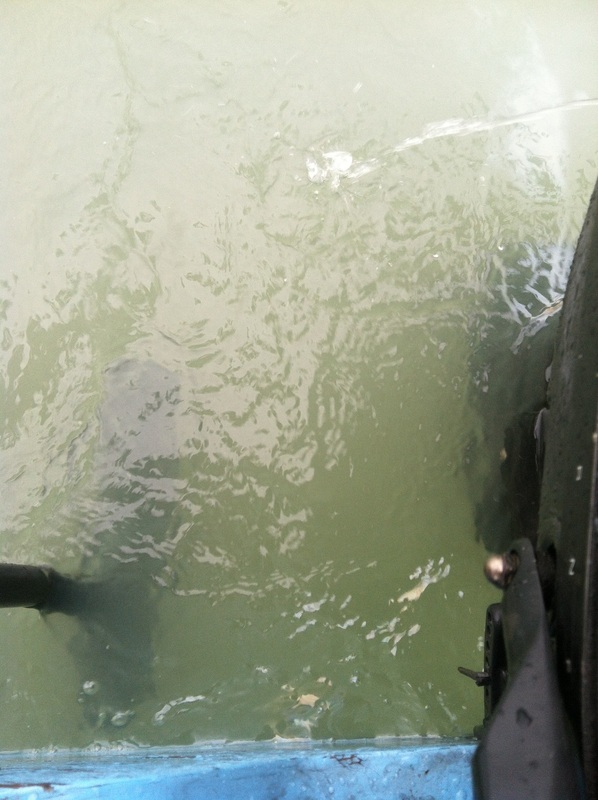 This much of a drop might have caused a turnover on Lake St. Clair which might have added to the length of dirty water. No matter, I was here now and determined to catch fish. I set up with the same 3 lures I used last time out, a #11 Bleeding Blue Shad, #9 Bleeding Copper Flash and a #7 Bleeding Olive. About 15 minutes in I had my first walleye on the #11. He was barely hooked on the trailing hook. 10 minutes later I had another one on the same lure and he too was barely hooked. When I first started I was the only boat out but by now a few bass fishermen showed up and started fishing the Edison discharge. I stayed in my area and hooked another in a few minutes. I didn’t think I was going to get this one in as I was being bounced around by the wake of a cabin cruiser that decided to do a doughnut around me. This one was barely hooked as well and I lost him at the boat. All it took was a split second of slack line and he was gone. Oh well….it happens. Since all 3 fish came on the #11 I decided to swap out the smaller lures for some bigger ones. I put on a #11 Bleeding Chartreuse and a Smithwick Clown. 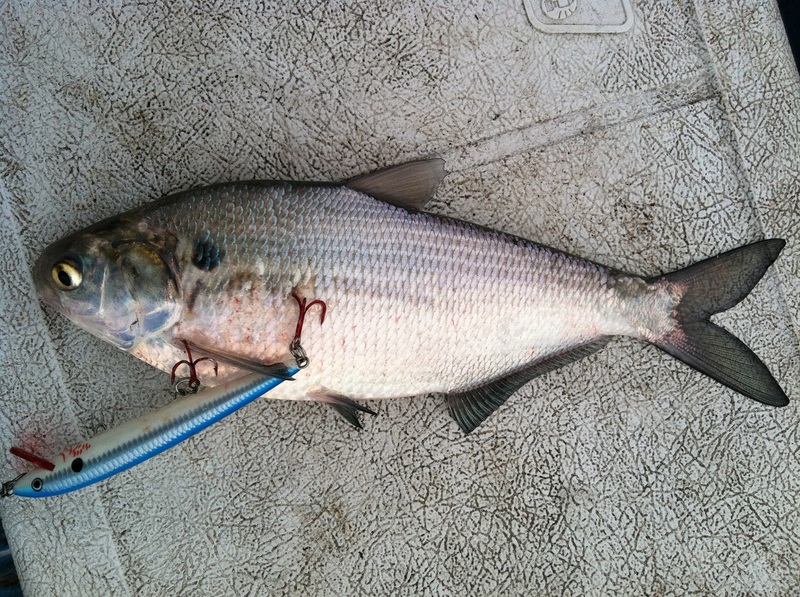 I was heading towards the discharge area and I noticed a lot of Gizzard Shad jumping out of the water. There were a few Blue Herons staked out along the edge trying to pick off an easy meal. A Bald Eagle also took up a roost on a nearby tree. As I turned right and started to head east I picked up another fish. Something didn’t feel right and it turned out to be a snagged shad. After I turned him loose I headed back downstream and set up to make another run. No sooner did my weight hit bottom when I had another fish on. This turned out to be another walleye and he grabbed the Smithwick. I made a loop back through the area but no other takers. I fished until 10:00 am before I pulled lines and headed for home. I would have liked to stay out a little longer but I had things to do at home. Final tally was 3 kept and one lost. Don’t know how much more I will be able to get out this year. With the water being this dirty fishing after dark is out of the question. Next weekend I will be up deer hunting so my next opportunity will be Thanksgiving weekend.